Already having claimed the Irish elite title aged just 16 years, Lara Gillespie has gone a brilliant ride at the World Cyclocross Championships today. It was her first trip to a Worlds. And despite riding as an U16 last year and only having moved up to the junior ranks a matter of weeks ago, she was in the U23 event today. But being overawed by the occasion or the step up wasn’t for her. Instead she set about getting the very best out of herself on a testing course against the top U23 riders in the world. And the exciting news for Gillespie, and indeed Ireland, was that her best was very good. Eve Richards of Great Britain took the title after just under 38 minutes of racing. In the silver medal position came Ceylin Del Carmen Alvarado of from host national Holland. She was 38 seconds down. And rounding out the podium was the Austrian rider Nadja Heigel; some 1:24 down. Lara Gillespie finished in 23rd place. She was 5:52 down on the winner and 3:17 off a top 10 finish. But having raced only on the Irish scene and the fact she is just 16 years old, and the youngest in the race, it was an excellent performance. Exposure to Continental European Cyclocross for even a season would bring her on significantly. 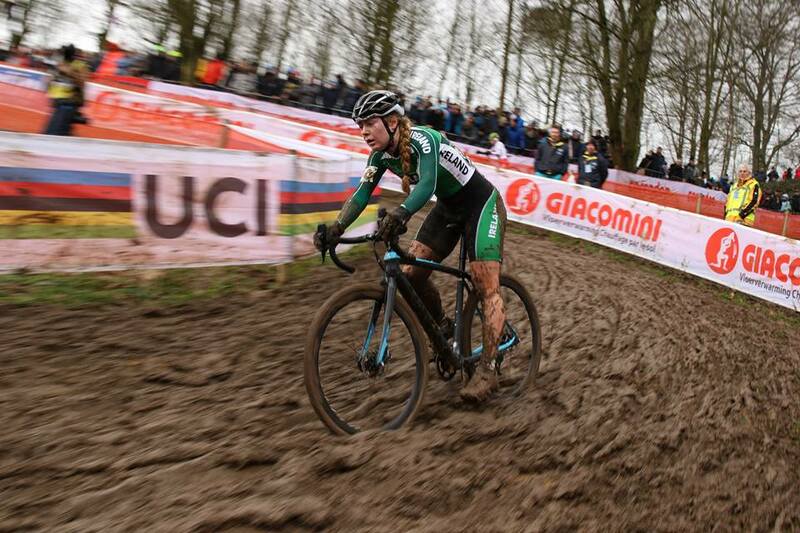 She has two more years in the juniors ahead of her and four in the U23 ranks after. It means she can come back to the U23 Worlds another five times. And while it is early days yet, her performance today suggest a bright further for teenager Gillespie. The only slight concern is that given her achievements across a range of sports already she may be enticed away from cycling. She’s a former U12 and U14 national triathlon champion. She won all of Irish cycling’s U16 road and track titles on offer last year; six in total. And she also claimed the U16 national cyclocross title. Also last year; Lara Gillespie took TT silver in the European Youth Olympics. And earlier this month she won the elite women’s race at the national cyclocross championships.